Nigeria was scheduled for Independence from Britain in 1960, and three main political parties ran in the preparatory elections in 1959. When no party won a majority during the 1959 elections, the NPC combined with the NCNC to form a government, and when independence arrived in 1960, Abubakar Balewa was made the Prime Minister, and Nnamdi Azikiwe was appointed Governor-General. Killed in 1966. When Nigeria became a Republic in 1963, Nnamdi Azikiwe was elected President of the Federal Republic, and Balewa remained as Prime Minister. However, there was great controversy over the 1963 population census, which the Igbo thought overestimated the number of Hausa-Fulani in order to give the Northern region more representation in the federal parliament. The NCNC split with the NPC and joined with a splinter of the Action Group led by Obafemi Awolowo to form the United Progressive Grand Alliance (UPGA) while the NPC led a coalition with Akintola's faction of the old AG to form the Nigerian National Democratic Party (NNDP). Killed in 1966. In January of 1966, some Igbo army officials staged a coup d'etat to overthrow the government. Members of the army killed Balewa, Bello, Akintola, and some senior officers; Azikiwe was outside of the country at the time. Johnson Aguiyi-Ironsi was placed in charge of the new military government. Despite the fact the coup was a bloody one, the new government promised a progressive program, a return to civilian rule determined by elections, and vowed to stamp out corruption and stop violence. Aguiyi-Ironsi tried to restore discipline within the army, suspended the regional constitution, dissolved all legislative bodies, banned political parties, imprisoned Awolowo, and formed a centralized Federal Military Government. A decree was issued in March of the same year to abolish the federation, and unify the federal and regional civil servants. There were many suspicions that Aguiyi-Ironsi favored the Igbos over other ethnic groups, and the fact that the military government did not prosecute the officers who had killed the northern leaders stirred further rage. Though Aguiyi-Ironsi gave some concessions to northerners, many Hausa-Fulani felt the coup was a plot to make the Igbo dominant in Nigeria. Still alive In July of the same year, northern officers staged another coup, killing Aguiyi-Ironsi and many other Igbo officials. The Muslim officers chose Yakubu "Jack" Gowon (who was a Christian) as the new ruler. Gowon had not actually been involved in the coup, but they felt he would be the best compromise candidate to head the Federal Military Government. His first steps included restoring Federalism, and releasing Awolowo from prison. Gowon vowed to start Nigeria along the road to civilian government. However, when Gowon moved to split the 4 existing regions into 12 states in 1967, Chukwuemeka Ojukwu, the leader of the Eastern Region refused to accept this and declared that the Eastern Region would become it's own independent republic named Biafra. In June 1967, civil war broke out which lasted until Biafra surrendered in January of 1970. Killed in 1976. In 1974, Gowon broke his promise to return the nation to civilian rule, and in July of 1975 there was another military coup; for a change, Gowon was not killed. Murtala Muhammed took over, promising the continuation of the federal system of government with constitutional laws guaranteeing fundamental human rights, maximum democratic participation, and an orderly return to civilian rule. Plans were made to move the national capital from Lagos, but this became a tremendous drain on the economy. Military In February of 1976, there was an attempted coup by Buka Dimka, and though it was unsuccessful, it was very bloody; Muhammed was killed. Olusegun Obasanjo was chosen to take his place as the new ruler, and promised to continue what Muhammed had started. During his term, he raised University fees, and this led to student riots. The government banned student organizations, restricted public opposition to the regime, controlled union activity, nationalized land, and increased oil industry regulation. However, in 1978, a new constitution was written that would return the country to civilian rule, and elections were held in 1979. Still alive but placed under house arrest in 1983. Shehu Shagari was named the new president in the 1979 elections, though many felt that he did not meet the requirements for winning. He stayed in power for his entire term, and when the new elections were held in 1983, he won again. Many people were convinced that the elections were rigged and that Obafemi Awolowo had actually won; violence erupted in many areas, and every election was contested in court. Still alive. Another coup took place on December 31 1983, although this one was actually quite welcome at the time because many Nigerians felt that the nation had deteriorated into shameless corruption and economic mismanagement. Shagari was placed under house arrest, and Muhammadu Buhari was named the new leader. Buhari set out to try to revive the economy, giving this priority over returning the country to civilian rule. He also restricted freedom of the press, suppressed criticism of the government, and outlawed many political and labor organizations. In addition, he declared a War Against Indiscipline to deal sternly with indecent public behavior, inadequate sanitation, corruption, and smuggling, while encouraging patriotism. His fiscal policies made it difficult for many companies to run profitably, and eventually led to high inflation. His inflexibility led to increasing discontent. Still alive Yet another coup that took place on August 27, 1985. This time Ibrahim Babangida (Buhari's chief of army staff before the coup) was named Chairman of the Federal Executive Council. Babangida claimed that the reasons he rebelled against Buhari was the insensitivity of the regime to the feelings of the Nigerian masses. He began his rule claiming to be a human rights activist, and did release some of the politicians that Buhari incarcerated. However, he also hounded opposition interest groups, and detained many people for political offenses. Economically, Babangida introduced market reforms, freeing exchange and interest rates which led to a sharp drop in the value of the Nigerian currency while raising lending rates to more than 40 percent. In April of 1986, there was an attempted coup by Mamman Vatsa; he and his followers were executed. On April 22, 1990, there was another attempted coup by Gideon Orkar that failed, but almost killed Babangida. Unlike the other coups, this coup was believed to have been heavily funded by civilians, implying that the civilian leaders of Nigeria were willing to accept another military ruler over the current government. A new constitution was set up in 1990, and the country was to return to civilian rule in 1992. As the date approached, there were suspicions that this promise was not going to be kept. Pressure started mounting, and finally, in 1992, the Federal Council allowed an election to take place. However, the Babangida government annulled the results of that election, claiming fraud, and postponed additional elections for a year. Another election was held in June of 1993 and the winner was declared to be Moshood Abiola. Babangida again claimed fraud, and annulled the results of the second election, which was believed to be the first fair election held in the history of Nigeria. Hundreds were killed in demonstrations, human rights and pro-democracy activists were arrested, and opposition newspapers were shut down. Internal and external pressure mounted, and finally on August 27, 1993, Babangida resigned. Ernest Shonekan, a civilian, was appointed President. Still alive Shonekan's rule was the shortest in history, lasting less than 3 months; he was overthrown by Sani Abacha on November 17, 1993. Abacha is believed to have been instrumental in both the 1983 and the 1985 coups, and was Babangida's defense minister. Died of heart attack on June 8, 1998. Sani Abacha is probably the most 'famous' president of Nigeria if only because of his brutality. Initially, Abacha promised to return the government to civilian rule within two years. In the meantime, he dismantled all elected institutions, terminated all national and state assemblies, closed independent publications, banned all political activity, and suspended the constitution. Abiola, backed by politicians, retired army officers, and pro-democracy activists, proclaimed himself president; he was imprisoned on charges of treason was placed in solitary confinement. One of Abiola's wives launched a campaign for democracy and human rights shortly after his arrest and was assassinated, most likely on government orders. Wole Soyinka (the 1986 Nobel Prize winner in Literature) was also to be arrested, but was tipped off and escaped. Abacha charged him in absentia with treason, and was sentenced to death in absentia; he was in exile for the remainder of Abacha's life. In 1995, Abacha announced a three-year program of transition to civilian rule. On March 1, 1995 there was another attempted coup by Lawan Gwadabe. Also suspected as part of this coup were Olusegun Obasanjo and Shehu Musa Yar'Adua. They were sentenced to 25 years of imprisonment for this. Yar'Adua died while in prison, and Obasanjo was there for the remainder of Abacha's life. Also arrested sometime in 1995 was Dr Beko Ransome-Kuti, a human rights activist who had been repeatedly arrested and released, but this time was charged with treason and sentenced to life imprisonment. That same year, trouble began with the Ogoni people. Ken Saro-Wiwa (an environmentalist and playwright) criticized the Nigerian government for the environmental damages being inflicted by the oil industry on the land inhabited by the Ogoni people. Saro-Wiwa and 8 other leaders were arrested on charges of conspiring to slay political opponents and all 9 were sentenced to death by hanging. Opposition to this sentence and an appeal for mercy came from all over the world,. However, on November 10 they were hung. This stunned the world, and led to the suspension of Nigeria from the Commonwealth,; Nelson Mandela called for international sanctions against Nigerian oil, which account for more than 90 percent of the foreign currency earnings. This hurt the already deteriorating economy, and Abacha tried to improve his image by portraying Nigeria as a regional peacemaker,. In 1996, he negotiated a peace agreement that ended Liberia's 7-year civil war. When a military coup took place in Sierra Leone, Abacha stepped in and sent the Nigerian army to restore the democratically elected government. With these acts, people started to become more confident that he would return Nigeria to democratic rule as he had promised. On December 21, 1997, there was another attempted coup on the Abacha government by Oladipo Diya, and he was imprisoned. In April of 1998, Diya, 4 other officers, and a civilian were sentenced to death, while many others were sentenced to prison terms of varying lengths. Elections to return to civilian rule were set for August 1, 1998, with a return date to civilian rule set for October 1, 1998. However, in April, Abacha became the only nominated candidate for the presidency. Opposition to his rule had been mounting more and more in recent months, because it was suspected that he did not intend to step down. Demonstrations and riots broke out, and many were killed. On June 8, 1998 Abacha died of a heart attack at the age of 54. Military After Abacha died, Abdulsalam Abubakar took his place, and set up a transition program that would lead the country back to democracy by May 29, 1999. Civilian Jailed during Abacha's regime on charges of allegedly plotting against the Abacha government, Obasanjo was supposed to serve a 25 year term. However, after the death of Abacha he was released from prison by Abubakar, and was subsequently encouraged to run for president in the upcoming elections. After a series of primaries, Obasanjo was declared the new democratically elected president, and he was inaugurated as the new civilian president on May 29, 1999. Yes, this is the same guy that was military dictator from 1976-1979. Civilian The 2nd President of Nigeria's Fourth Republic. 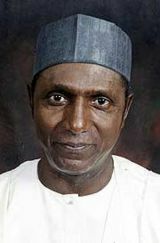 He served as governor of Katsina State in northern Nigeria between May 29, 1999 and May 28, 2007 . He was declared the winner of the controversial Nigerian general election of 2007, held on April 21, and was sworn in on May 29, 2007. He is a member of the ruling People's Democratic Party (PDP).